IIS 8.5 and later Enhanced Logging was introduced in IIS 8.5. IIS 8.0 and earlier Enhanced Logging was not supported prior to IIS 8.5. 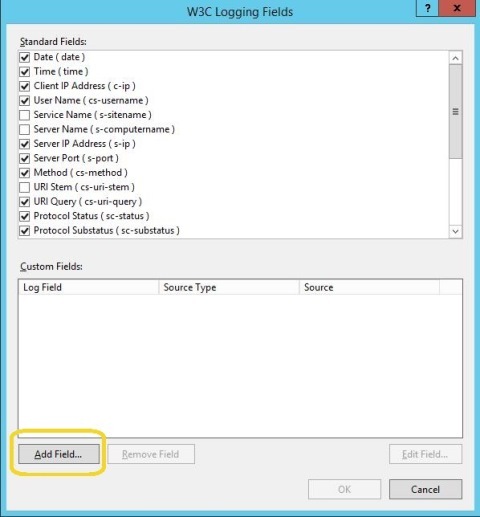 Internet Information Services (IIS) on Windows Server 2012 provides limited logging capabilities for a fixed set of standard fields, without options for extensibility or customizability for logging. Administrators who need to log fields beyond this standard set must create a custom logging module. In IIS 8.5 and later, the administrator has the option of logging additional custom fields from request or response headers, or from server variables. Select the site or server in the Connections pane, and then double-click Logging. Note that enhanced logging is available only for site-level logging - if you select the server in the Connections pane, then the Custom Fields section of the W3C Logging Fields dialog is disabled. In the W3C Logging Fields dialog, click Add Field.... Note that enhanced logging is available only for site-level logging - if you selected the server in the Connections pane, then Add Field... is disabled. 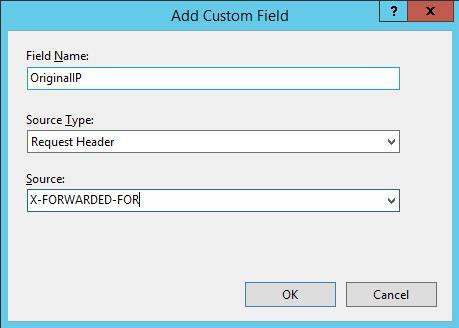 In the Add Custom Field dialog, enter a Field Name to identify the custom field within the log file. Please note that the field name cannot contain spaces. Select the Source Type. You can select Request Header, Response Header, or Server Variable (note that enhanced logging cannot log a server variable with a name that contains lower-case characters - to include a server variable in the event log just make sure that its name consists of all upper-case characters). Select Source, which is the name of the HTTP header or server variable (depending on the Source Type you selected) that contains a value that you want to log. You also can enter your own custom source string. For example, to record the custom HTTP Header "X-FORWARDED-FOR", enter that string in Source. Click Add Field... for each additional custom field you want to add. You also can click Remove Field to remove a custom field you added or click Edit Field... to edit it. Click Apply in the Actions pane to apply the new configuration. Once the custom fields have been configured, IIS will create new text log files with "_x" appended to the file name to indicate that the file contains custom fields. Note that the total size of data collected from all custom fields cannot exceed 65,536 bytes. If the total exceeds 65,536 bytes, then IIS will truncate the data. 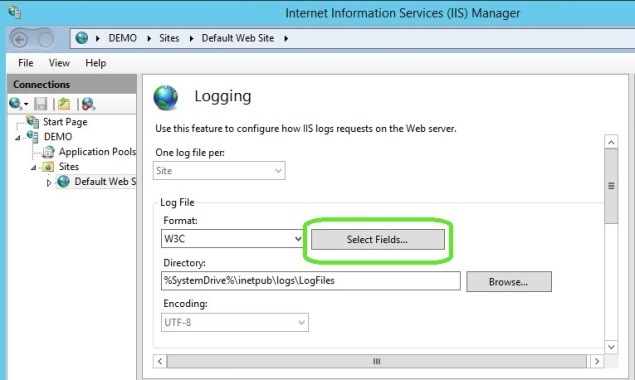 In this guide, you have configured IIS to add custom fields to the IIS logs.